Your vehicle is built to travel on the bumpy, sometimes pothole-riddled roads of Overland Park. Still, over time, your suspension components will start to exhibit wear that requires attention. When your car bounces more than it should, you hear clunking or banging noises over the smallest pothole, or every road seam on the interstate is tooth-jarringly harsh, you likely need some sort of suspension repair. New Concept Auto Service is your one-stop shop for quality suspension repairs in Overland Park and the surrounding communities. Our staff members are dedicated to ensuring your safe motoring. We provide honest customer service while performing reliable, long-lasting suspension repairs on your vehicle. Whether your Chevy Cruze needs new struts, your Dodge Charger has a knocking sound when turning, or your Hyundai Sonata requires a new control arm, New Concept Auto Service has you covered. Our ASE-certified master technicians— two of whom are also L-1 certified for advanced engine performance— have years of experience diagnosing suspension problems and performing suspension repairs on most domestic and import makes. We perform a complete diagnosis on each suspension concern, so you won’t make needless repeat trips for the same issue. Once we’ve determined the root cause of all your symptoms, we’ll discuss a repair plan with you in detail for you to be fully informed of your vehicle’s needs. We perform only the repairs you authorize, always using high-quality aftermarket and original equipment parts for the most durable suspension repairs. Honest. Accurate. New Concept. Call us or use our online appointment form to schedule your suspension repair today! At New Concept Auto Service, you can rest assured that an ASE-certified technician is working on your suspension repair. We have the expertise and training to repair any concern that pops up, from fluid leaks to worn out parts. We perform suspension repairs on all domestic and import models, regardless of the vehicle’s age. We have the necessary diagnostic tools and the repair technology to efficiently and accurately perform your suspension repair right the first time. 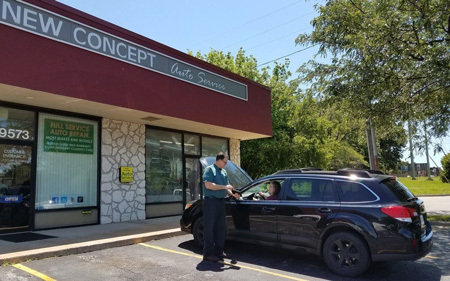 It can be inconvenient trying to coordinate your suspension repairs around your school classes or work, so we work around your schedule to make your visit as hassle-free as possible.